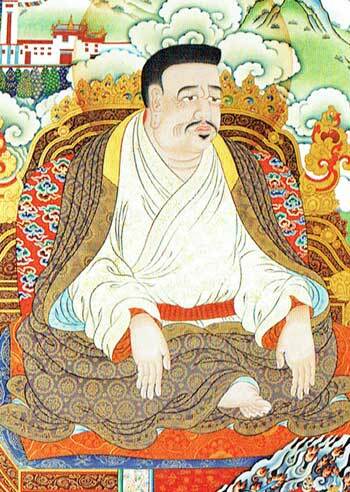 Marpa Chökyi Lodrö was born in the southern part of Tibet known as Lhodrak. In comparison to other children he was wild and untamed, with a fearsome temper. This made it hard for his parents to educate him at home and so he was sent off to be trained in the Dharma at a young age. Marpa studied with Drokmi Shakya Yeshe the translator and became a master not only of the Tibetan language, but also of Sanskrit. However, feeling that he was unable to receive a complete Dharma education, he decided to make the hazardous journey to India in order to study with renowned Buddhist masters. He first returned home to Lhodrak and converted his entire inheritance into gold for his travel expenses and to make offerings to his prospective Indian gurus. Marpa made the arduous journey to the India three times. During these long, exceedingly dangerous and expensive journeys he showed complete disregard for his own body, possessions, and welfare. Arriving first in Nepal, he studied with Paindapa and Chitherpa, two famous students of Naropa. Hearing of Naropa, a strong connection from previous lives was reawakened in Marpa, and he yearned to meet this Indian siddha. Consequently he travelled to Pullahari, near Nalanda University, where Naropa taught. Marpa spent twelve years receiving initiations, instructions, and studying with Naropa and other great Indian gurus. At the end of these twelve years, Marpa offered a ganachakra and sang his first song of realisation to Naropa. Upon his return to Tibet he married a spiritually gifted woman named Damema, taught and continued his Dharma activities. He subsequently returned to India for a second time, remaining with Naropa for a period of six years. When it was time to leave, Marpa promised Naropa that he would return to India to complete his training. Although he was quite old by this time, he made the third journey to India after receiving a prediction from the dakinis. Upon his arrival Marpa was distraught to discover that Naropa, having already entered into the tantric conduct, was nowhere to be found. However, with determination, trust and devotion, Marpa managed to find Naropa and receive the final teachings. One of the most important teachings that Marpa received was the Six Yogas of Naropa. At the conclusion of his last instructions to Marpa, Naropa said, “Now, Marpa, your realisation is entirely equal to my realisation. There is no need for you to obtain further instructions or empowerments from me. You must go back to Tibet as my regent, and spread and cultivate this lineage.” At that time, Naropa prophesied that Marpa’s family lineage would not continue, but instead that his lineage would be carried on by disciples. He added that each successive lineage holder and his students would be brighter and have greater opportunity to achieve realisation. Marpa brought the teachings and lineages of Vajrayana and Mahamudra back to Tibet. Upon his return, Marpa spent many years translating Buddhist scriptures and contributed to the effort of bringing the complete Buddhadharma to Tibet. Many of his translations are part of the Kangyur and Tengyur. It is because of the hardships that Marpa was willing to endure during his travels to India that most of the Kagyu traditions and teachings have been available. Not only did he bring the teachings to Tibet, but through enormous perseverance he also accomplished the practices and communicated, through translation, the actual experience of the teachings. Marpa studied, worked, translated, and practiced for over forty years, and made all that he experienced available to others. For this reason he is often called the father of the Kagyu lineage. Marpa had numerous disciples. The four most outstanding students were known as the Four Pillars: Ngok Chöku Dorje received the transmissions and mastered the explanations of the Tantras; Tsurtön Wanggi Dorje received the transmissions and mastered the practice of Phowa; Meyton Chenpo received the transmissions and mastered the practice of Ösal; and Milarepa became the principal disciple to receive and master the complete transmissions of Marpa. Milarepa thus became Marpa’s spiritual heir and carried the lineage of Naropa.